The clear first-generation version of the Westone UM Pro 30 Triple-Driver Universal In-Ear Monitors are designed for personal listening and professional stage monitoring applications. The monitors utilize triple balanced armature drivers in a passive crossover network to deliver a frequency response of 20 Hz to 18 kHz at a sensitivity of 124 dB SPL at 1mW into a 56 Ohm load. The included sound isolating star and true-fit tips provide a passive noise attenuation of 25 dB and the replaceable 50" EPIC cable is designed to fit over your ears to help reduce microphonics and secure the earphones in place. They come with premium comfort tips, a mini-monitor vault, and a cleaning tool. 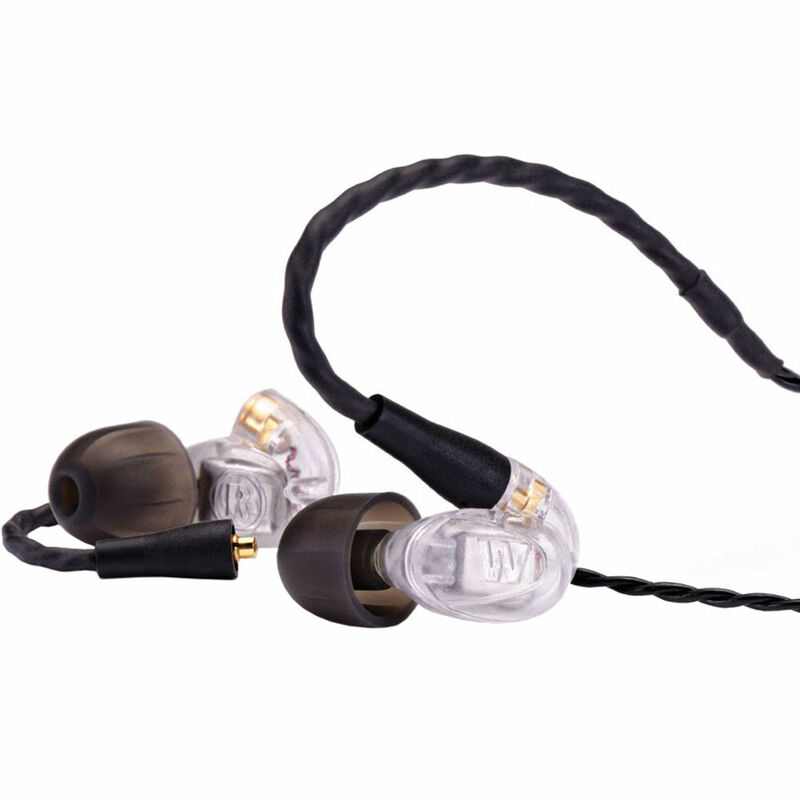 UM Pro 30 Triple-Driver Universal In-Ear Monitors (Clear, First Generation) is rated 4.8 out of 5 by 12. Rated 5 out of 5 by Nathaniel A. Smith from Excellent In-Ear Monitors I've finally had the chance recently to use these In-Ears during a radio show and while performing. First of all, I have acquired?a whole new experience listening to music now. You hear every detail as clear as if you were in the room while recording. These In-Ears are very comfortable and I've been using the?basic buds that came already installed. It takes practice putting them on quickly but once you master it, it's a breeze. Definitely, give these a try. I read multiple reviews on these before purchasing. B&H had the best price ever!! Rated 5 out of 5 by Anthony from Detailed, isolating, and durable Having worn these now everyday for near four months, I am completely happy. The cable management is supprisingly easy, packing useful (otterbox), eartips a good selection. Detail and speed seem slightly less than $200 pair of etymotics, but Pro 30 dynamic range smokes the etymotic Hf5. The sound is way more neutral and far less exciting than Grado iGe. Comfortable enough for all day wear, and don't sit way too deeply in my ear canal like the Hf5s. I would buy again, but $400 set of ear buds for me is a once a decade purchase, meaning the model and tech will likely be superceded. Rated 5 out of 5 by LSTEP from Excellent sound I'm a drummer and I find the bass to be extremely present. It blows away any other in-ears that I've heard. Rated 5 out of 5 by Mr. Yeet from Excellent. Excellent. Excellent. I use these in ear drivers with the Audio Technica M3 IEM (in ear monitor) system. The drivers that came with the AT unit were muddy in the bass, weak in the middle and tinny on the top end. Nevertheless, the move from floor monitors to IEMs was amazing. I stuggled with the OEM drivers for over a year and finally made the jump to the Westone UM Pro30 monitors. Before the Westones, it was easy to decide it was too much trouble to set up my IEMs for too many gigs. Now it's unthinkable to go without them... The difference from the old drivers to the Westones was equal to or greater than - the initial move to the IEM system. Transformative... The sound of these monitors is clean and as loud as you could want them. Not too bassy. Not much bump in the mids. Just like a nice, gentle smile in the EQ with full bottom and crisp highs and a bit of a scoop in the mids. They are basically flat - like a mointor should be. The fit is beautiful. Not only do you get a great selection of silicone and foam ear tips to try - oh no. The body or shell of the driver also fits into the ear with a satisfying almost click-like thump. There is an extra layer of shrink wrap over the area of the cord that has to curve over the top your your ear. This has excellent memory and keeps its shape. The slider that adjusts up from the Y split in the cable stays put too. Between the slider/stop at the back of your neck, the memory curve over the top of the ear and the shell/foam tip? The overall fit of the monitors is very secure. The entire driver fits well inside the ear opening but the foam tip does not get too invasive into the actual ear canal. The tip is super soft and smooth. Others have said you could sleep in these things as they fit so flush to the ear opening. It's true. I used the red foam tips. The tips themselves have a small hard sleeve that clicks solidly onto the reciever of the driver. It's this sleeve that's colored and marks the tips' size. I did not even try the silicone tips as I wanted really tight isolation. I got it. Silicone tips tend to work their way out too with heat and sweat and you lose your seal. These foam tips and the body of the driver Do. Not. Move. If you don't find the right fitting tip - say, too small, you may get a loose fit and too much leakage. Too big and the opening in the tip might be squeezed shut, cutting output. But you know immediately when it's right. Westone also offers extra tips as an accessory in the color/size you find works best and the cables are detachable/replaceable. I was able to dial in very good performance with a minimum of fuss. Sometimes I submix my IEMs with a small Mackie 2-channel mixer - just bass and vocal for small stages wher we use PA-on-a-stick. Sometimes I bring in a full auxiliary send from the big Allen and Heath board. Either way, I get my mix and I do not have to drive the belt pack anywhere near as hard to get the volume I need. In fact, the isolation and cut in ambient stage volume is so good, I can run the IEM system softer. This is when I have found that I actually need to dial in my voice a bit louder so the reinforced vocal will overcome the plugged up feel of my voice in my head. But again, with really crisp, powerful efficient drivers like the Westones, it's easy to get the sound you need. I fear no more the Fender Twin Reverb... The only thing I miss from the Audio Technica monitors is the threaded collar at the 3.5mm plug. That's likely a pretty standard sleeve over TRS plug design and it would make for added security once the headset is plugged in if you could tighten the collar. But the Westone plug is a right angle on the cord. It would take quite a tug to pop it out of the belt pack receiver. I could also have used some sort of at the factory designed color coding - red for right, white for left on the shells. They are marked R/L, but it's hard to tell - especially if you buy the clear shelled model. I'm not sure why one wouldn't... It's very cool to be able to see the innards of these little jewels. I just used a paper punch and made two little stickers out of red/white colored electrician's tape and stuck them onto the shells. Problem solved. The monitors came with a very servicable storage box with a gasketed lid that clicks shut securely. I did not give a rip about the rest of the packaging - but it was nice and protected the product perfectly in transit while making the unboxing a pretty creamy experience. Soon over though. B&H packed the factory box well; with a good sized carton and quality bubble wrap. I could not check durable below as I have not had them long enough. Nor could I click good value as I had nothing to compare too. But I WILL say that if you can get a good, 3-driver design like Westone's and easily get a comfortable, secure and isolating seal like their TruFit design - without having to pay an audiologist for ear molds and custom shells - you are likely ahead of the game valu-wise. And if you own an IEM system that sits unused too much because it came with substandard drivers? What could be a better value than actually wanting to use it because it suddenly sounds so much better? Rated 5 out of 5 by Adam from Incredible triple-driver in-ear monitor for under $300! I've only used them about 5 times now, but I can certainly say they are a huge step above the single-driver Shure pair i had. I'm using these as in-ear monitors for my live band. There is clarity even when it gets really loud. The bass response is smooth and clear, and never gets over-driven or distorts. Highly recommended. Rated 5 out of 5 by Brandon from Best IEM's I've EVER heard, Straight Up! If you're in the market for a great pair of IEM's, then look no further than these, especially if you're just listening to music like I am with mine! They're easily the best IEM's that I've EVER heard and owned, bar none! they have amazing balanced sound across the whole frequency spectrum, and the bass is Absolutely amazing without being too much! I'm listening to live 24bit FLAC Recordings that I make myself with Schoeps mics and Sound Devices Mixpre6 and Mixpre3 recorders, and the sound is just unreal! I feel like I'm RIGHT back at the show/concert with these, and they have amazing detail, clarity, isolation and comfort! You just can't go wrong with these IMO! I actually liked the 1st generation UM Pro 30 IEM's so much, that I just bought the 2nd generation UM Pro 30 for the full price of $400. If the first generation are still on sale for $250, it's an absolute no brainier! so if you want an awesome pair of IEM's for a killer price, then grab these and thank me later ?Ÿ˜Ž?Ÿ‘�?ŸŽ? ?Ÿ˜‰ They also have the highest sensitivity of ANY IEM's I've ever seen, and I don't need a HP Amp to listen to these through my Sony NW-A35 Walkman, since their sensitivity is a ridiculously high 124db. These things make my live recordings of the last 20+ years sound incredible and I would HIGHLY recommend them to anyone wanting a HQ pair of IEM's, for an amazing price of only $250. I can't wait to get my 2nd generation UM Pro 30 IEM's this week and I'll be using the first generation ones as a backup pair because I love them so much! Rated 5 out of 5 by May from Best IEM (for me so far) I have Grado SR80e, B&W P5S1 and this is a great addition to my collection :D. I use it to listen to music at work, it can block out the noise and very comfortable. The sound is amazing, it's especially great for acoustic, oldies, rock... basically anything besides some hip-hop. People who want floating bass might not like these... this bass is punchy accurate and not the type were it will make your hair stands. I love it so far, I recommended especially for this price. Rated 3 out of 5 by David from expected more The first time I used these IEM, was at church, Im a music director and needed to hear my band and voices, somehow I really never got any ear tips to give me the sound I needed, I even purchased different types of ear tips and still havent been comfortable with them. Dont get me wrong, Im sure other people may think otherwise. Ill keep on searching, maybe custom is a better way to go. Does the westone prp30 have inline controls(mic or remote)?my tascam won't work with these controls. Hello Charles. No the westone um pro 30 in-ear monitors do not have inline controls. My left ear bud went out. Ive had them for four months. Cant get it to work again. Can I get them fixed? I would contact Westone. I believe they have a 2 year warranty.